A remote control toy that works with Apple products. Innovative toy company Wow Stuff! have launched a series of iKon Remote Control toys that are compatible with the iPhone/iPod, and also have the official Apple seal of approval. The iKon Buggy comes with an iKon Remote Control Dongle that plugs into the spare port on an iPhone, iPod, iPad or iTouch. Once this is installed, you can download the free app to turn the iPhone into an infra red controller. 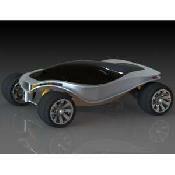 The Buggy is a great looking futuristic RC vehicle that's appealing to a broad age range of users. + The iKon Remote Control Buggy is compatible to use with Apple iPhone, iPad and iTouch/iPod products.